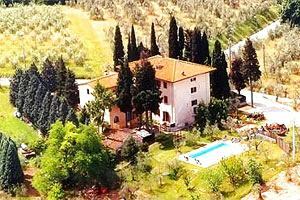 The villa (accommodation from 2 to 22 people) is located on the hills near Florence and is surrounded by typical Tuscan olive groves and vineyards. 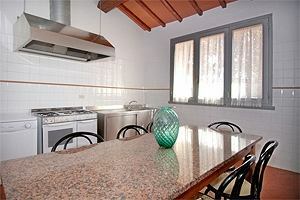 The villa was recently restored and is divided in 5 apartments of different size (accommodation from 2 until 8 people) with any kind of comfort (Sat TV, private telephone, computer with Internet connection). 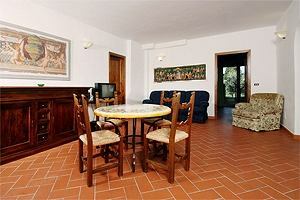 Each apartment has a private garden with gazebo in which is possible to put a barbecue. 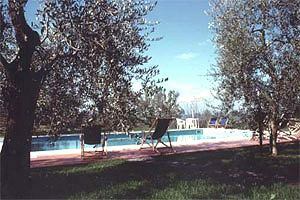 In the garden of the villa there is the swimming pool (6x12) with deckchairs and beach umbrellas. Mountain bikes for rent. 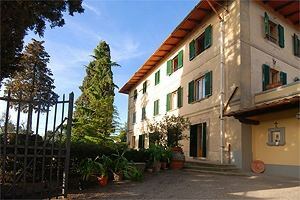 Tennis courts, riding school and lake to fish in the surroundings of the villa. 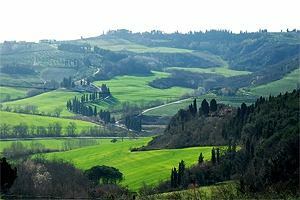 The villa is 20 km far from Florence and is the perfect starting point for excursions to Siena, Pisa, San Gimignano and various Tuscan cities. 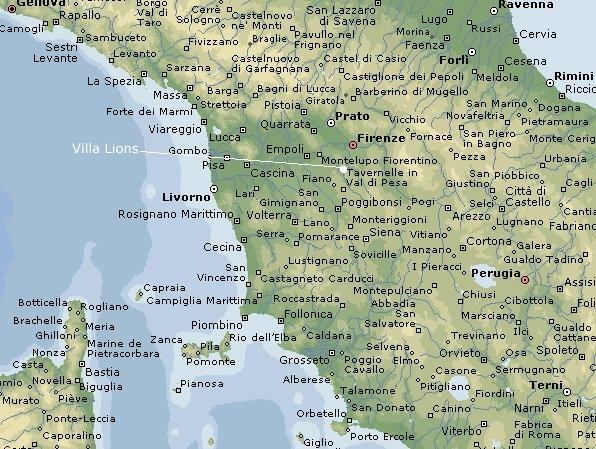 Distances: Florence 20 km – San Gimignano 34 km – Siena 66 km – Pisa 73 km. 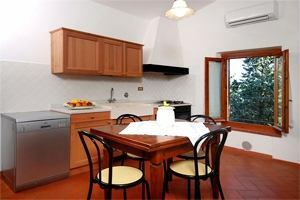 The Apartment 1 (3 bedrooms and 2 bathrooms) is located in the first floor of the villa and is composed by a kitchen, two double bedrooms, a bedroom with 2 single beds and 2 bathrooms with shower. 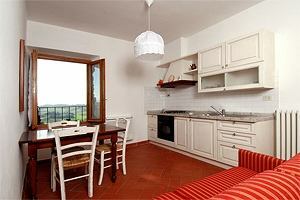 The Apartment 2 (2 bedrooms and a bathroom) is located in the second floor and is composed by a kitchen, 2 bedrooms with 2 single beds and a bathroom with shower. 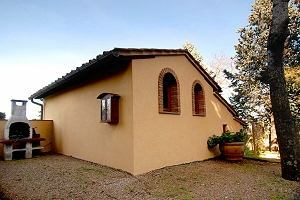 The Apartment 3 (1 bedroom and 1 bathroom) has been built in the old barn of the villa. 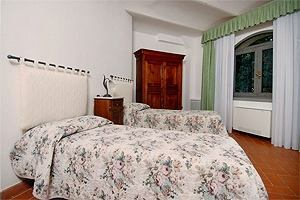 It is composed by an entrance/sitting room with a sofa which become 2 single beds, 1 bedroom with 2 single beds, a kitchen and a bathroom with shower. 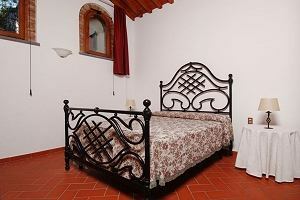 The apartment 4 (1 bedroom + accommodation for 2 people in sofa bed and a bathroom) is located in the second floor of the villa and is composed by a sitting room with sofa which become 2 beds, kitchen, 1 double bedroom and a bathroom with shower. The Apartment 5 (3 bedrooms + accommodation for 2 people in sofa bed and 3 bathrooms) is the biggest of the villa and is located in the ground floor. 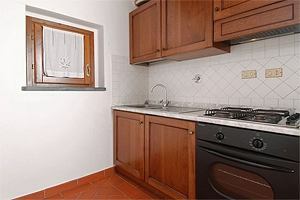 It is composed by a kitchen, a sitting room with a sofa with accommodation for 2 people, 2 double bedrooms, 1 bedroom with 2 single beds and 3 bathrooms with shower. 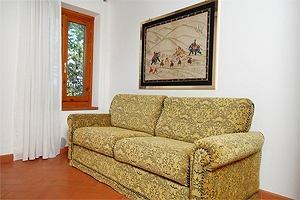 The apartment can host disabled persons.